Heat the olive oil over medium heat in a large sauté pan. Add the red onions and cook, stirring frequently, until very soft and pale purple in color, 7-8 minutes. Do not brown. 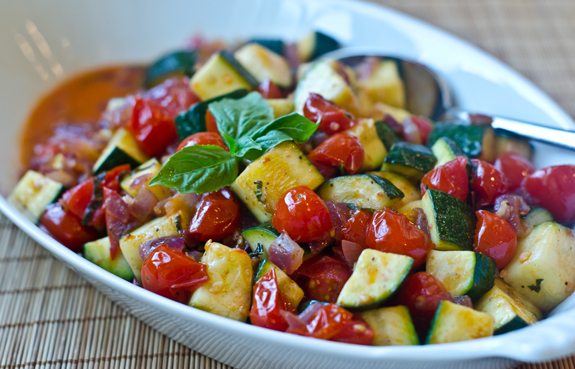 Add the zucchini, tomatoes, garlic, salt and pepper and cook, stirring frequently, for 3-5 minutes, or until the zucchini are cooked but still crisp and the tomatoes have started to collapse, creating a little sauce. Stir in the fresh basil, then taste and adjust seasoning if necessary. Transfer to a serving dish and garnish with more fresh basil if desired. Posted in Side Dishes, Vegetables.